This year we camped again with Oregon Country Fair Embassy at 150 degrees and Esplanade. It was a great location, and this year with extra frontage there was some breathing room in OCF. For us this year, key differences included arriving mid-Monday (aiming for Sunday but having to stop in Reno) and tent camping instead of RV camping. See notes on that below. In addition, in order to try to attend both Burning Man and the WorldCon back in San Jose, we left on Friday night and sadly missed the burn and weekend events. To my surprise the event was packed already on Monday. Tons of people coming for the entire week and a huge volume of first-time burners, resulting in the biggest Burning Man ever. I had actually hoped that early arrival would give me a taste of the smaller Burning Mans from years ago, but this is not to be. This year, we would be able to mount my 24' panoramic picture wall -- now 4' high and packed with pictures -- in a nice place right on the Esplanade in camp. I've found ever since putting up an art installation that a great way to experience Burning Man is to sit by your installation and meet and talk to the folks who come by. It's the sure way to meet many of the residents of Black Rock City. Plus my pictures create an automatic talking point, as people love to share their memories of where they were and what they did during each year that is displayed. I've explained what Burning Man is and my impressions of it in the essays for 1998 and 1999 so I won't repeat that here, but rather say what was different. Of course my real photographic goal is the Panoramas. So be sure to check out the new 2002 Panoramas including my first Night panoramas, and of course the 2001 Panoramas, 2000 Panoramas, 1999 Panoramas and the 1998 Pano. There are also photo essays from 2000, 2001 and 2003. This year I didn't do so many projects. Just my photo wall, the taking of the new photos, the T-shirts and some El-Wire stuff. However, trying tent camping for the first time, we did end up doing way too much preparation. You have to learn what not to take to Burning Man as well as what to take. The photo wall looked great this year, and was in camp, and well lit at night. It had a constant crowd remembering last years, and for the first time, with a better laptop and a printer and solar power, I actually shot a panorama on Wednesday and had it up on the wall that evening so people could see the current year. It's amazed me how often in the past people have thought at first the giant 24 foot picture is from the current year, as though it could easily be made on the Playa. The one I put up was a 4' long wide-angle, but I still think it was a major accomplishment. This year there was also a new camera, my Canon EOS-D60, replacing my D30 from last year. There was also a new Canon S40, which is pocketable and was used for more casual shots. This year's weather was great. The horrible dust of last year was gone, and days were warm and calm, but not too hot, and nights were perhaps a touch too cool but nothing really dreadful. The only rain and dust storm we saw was Friday night, which of course came as we were packing up. That's a real hassle. 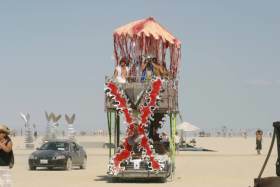 Some year Burning Man will be marked by a giant storm during Sunday or Monday and that will delay people getting out. I heard Tuesday was pretty messy. I was surprised, as I noted, with the number of earlier arrivals and the tremendous number of first-timers. I wondered if the down economy gave a lot more people the week off to spend at Burning Man. For people coming in as early as Wednesday it was already hard to find a campsite. Indeed, even on Monday much of the outer (Abyss) street was filled in with camps. I saw almost no sign of Sept. 11, which pleased me, though somebody did do a statue of the twin towers. 9/11 has taken over so much of life in the USA that it was good for BRC to be an escape from it. Just a week later, we'll be swamped with coverage. I have come to describe Burning Man now as something truly American. It is of course not mainstream U.S. culture in almost any way, but at the same time it is something that could only arise in America, I think. 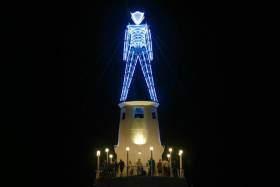 I met many overseas visitors to Burning Man, and they all agreed that there was nothing like it anywhere in the world. And there were a ton of my fellow Canadians at the event to boot. It's good to see it become more international as its reputation grows. This year even with five days I didn't manage to bike all the streets or visit all the Art. Too much participating, not enough spectating. I've been wondering if there's a way to design the city so that the most important street (Esplanade) is not also the shortest street. Even though Esplanade frontage is the most desired real estate in the city, it turns out the circle is the shape which has the least perimeter to enclose a given area. I think they should move toward a shape that looks something like Superman's crest with the top taken off and out to the Playa. I think they could also consider an "inner esplanade" which would be a wide boulevard 2 streets in, with pedestrian, bike and art-car lanes in each direction and a median strip for art. The floating world theme went off really well, better than I expected. There were tons and tons of nautical art cars and other related displays. An impressive number of full ships built on buses and trucks, and a giant 60 foot whale and shark that roamed the Playa. People didn't like the street names, especially degrees vs. clock hands, and only once did I hear somebody pronounce Forecastle properly (Foke-sole), which is not surprising. I felt really sad leaving early. It's become trendy now to refer to Black Rock City as your home, and the real world as the place you visit to work, but there is a real feeling to this sometimes. You wonder why the rest of the world is "normal" and Burning Man is the aberration. In some ways Burning Man has more Science Fiction (made real) than the World Science Fiction Convention, but at the same time the WorldCon has a tremendously educated and forward-looking crowd which is great for just sitting around and chatting about issues. And it has a lot less techno. While I have missed the WorldCon the last 4 years, having in my current home town was too much to pass up. Next year it's in my original home town, and doing both will be difficult so it will be a hard choice. Normally we've come to Burning Man in an RV. This year, because we wouldn't have time to give the RV a solid cleaning after we got back, we decided to tent it. We had a lot of stuff to build the installation so we also brought a trailer and a mini-SUV. You will sleep better. You get to "vacation" from the desert at night. You take a nice hot shower and restore your skin. Then you climb into the nice clean bed, possibly with the heater on, put in earplugs and sleep the night away. If you need to get up to use the bathroom, it's a short walk inside. In the morning, if it's really hot and generators are OK, you can run the air conditioning and get the sleep you need. This mini-vacation will restore you and help you enjoy Burning Man better. In a dust storm, you have a place to sit and watch the excitement in comfort. Or cook, or organize, or work on things. The freezer and fridge. You can have ice cream and other frozen things, and can grab cold water and other items on demand, as well as the cold foods, with no worry about ice or the mess of a cooler. Your own toilet, with a flush, though it is chemical and will stink at the end of the week, and will need dumping if more than 2 people. Hot and cold running water to wash dishes and your hands. I alread noted the warm showers whenever you want them. Solar showers are of course more ecological but only can be had in the day. A sound system to listen to radio stations. If generators are OK, the generator, which can power A/C, your tools, blender, etc. If not, you have the RV battery plus others you bring. It's a big vehicle and can bring a lot of stuff, on the roof and inside. Tables to work on for projects, and cook on. You have a mini-house. During exodus, you have your house with you. You can use the RV before or after BM to tour the Great American West. Breaking camp is a lot faster. Just load stuff you took out, secure for driving and go. If you run the generator, it's noisy and smelly for you and your neighbours. It's big, and while that can be a good windbreak for camp, it takes a lot of room in camp, and in a tight camp you might not be able to leave. It costs a lot more. Miles are expensive. It can get pretty hot in the day but so will a tent. You can ventilate. 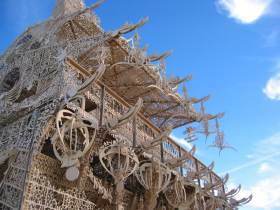 It will get very dusty and it's a lot of work to clean a rental RV after Burning Man. Expect many hours to get it to the sort of shape where the rental place will be willing to rent to Burners again. The other big one -- you may be tempted to spend too much time in your comfy RV. Time you spend in your RV is time you're not spending at Burning Man. A lot cheaper, and you can have a lot of the amenities -- porta-potti, solar shower, air bed, camp stoves, camp sink, cooler with dry ice etc. You can buy all this stuff for a fraction of one week's RV rental. You can probably take your time cleaning and sorting stuff when you get back, no rental vehicle to return. If you rented a car, you can probably take it to a full service car-wash for a lot of the cleanup. You can actually get very large cabin tents if you need space, but they will be too hot for much of the day to spend time in, which is good and bad. More subject to blowing down in a windstorm. In a storm you must seal things up so you can't watch the show. For better or worse, you get more of the shared Burning Man experience with the desert. You can do a lot to run your camp, even an RV, without much or any generator use. Costco sells 115 amp-hour deep cycle RV batteries for $43. These each hold a kilowatt-hour of power, enough to run an 8w flourescent lantern every night, and thus really a lot more. If you have an RV, consider bringing flourescent lamps, which take 1/4 the power of the incandescents they put in the RV. A couple of those batteries will provide most people's power needs, even enough to run fans, evaporative coolers, some power tools (with a good inverter), laptop computer, camera battery chargers etc. If you can get your hands on a solar panel, you can also hook that up. I brought a 42w solar panel, which in the desert is worth about of 1/3 of one of those RV batteries per day. 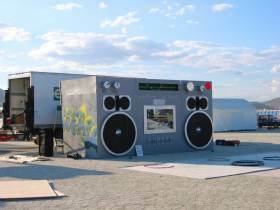 About all you really would need a generator for is RV A/C or Microwave, and powerful stereo systems in Rave camps. Instead, find people who are using generators and take your battery and a 20amp charger over to them. That will take just 240w of their power, and recharge your battery from dead in about 5-6 hours. Plus you can drain your car's battery. Try not to kill it but don't worry if you do, there will be tons of people around able to give you a boost when it's time to go.